Bedding your rifles action and barrel enhances the rifles accuracy in three ways. 1. Action and barrel are mated perfectly with the woodwork. 2. Reduces the environmental impact on your rifle. 3. Floats the barrel thus allowing the natural harmonics of the barrel, this ensuring consistency from shot to shot. 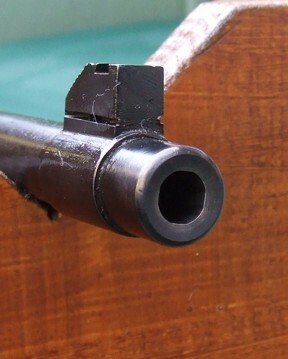 Crowning the barrels muzzle enhances the rifles accuracy in that it permits propellant gases a resistance free and consistent path away from the projectile as it exits the bore. Finally it protects the bore from damage and enhances the rifles appearance. Heavy or course triggers simply cause your rifle to be inaccurate. At TVG we can stone and polish your trigger by traditional methods to reduce the pressure or we can insert a modern aftermarket trigger to provide an adjustable, light design, thus improving accuracy considerably. This is a hot chemical bluing process and requires the rifle to be completely stripped and the original bluing removed with fine emery paper. The receiver/barrel or part is immersed in the solution, producing a good deep quality blued finish. 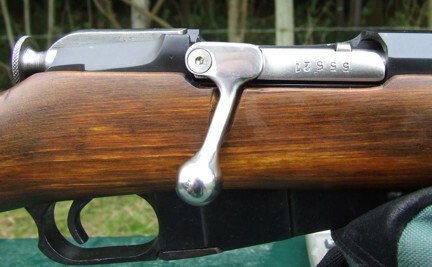 Many classic rifles have “straight” bolts which prevent the fitting of a scope. We can fit after market designs such as the one shown on the left. Alternatively we can also manufacture our own bolt handles such as the one shown below. The bolt handle should be fitted by a competent Armourer or gunsmith.